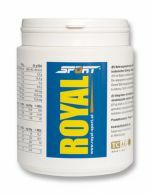 ROYAL SPORT is an isotonic drink which is characterized by its unique and outstanding coordination of its ingredients and their active ingredients and at the same time makes possible de-acidification. A drink is called “isotonic” if the dissolved ingredients in the drink cause the same salt pressure as in human blood. ROYAL SPORT generates this effect and in addition fights against acidity conditions during and after sports. The characteristics of ROYAL SPORT go far beyond the mere use as an isotonic drink. With leisure time athletes and athletes, through an increased transpiration the loss of high amounts of water, glucose and minerals must be balanced out in order to protect the body from deficiency symptoms. ROYAL SPORT works acutely as well as systematically, that is acutely through replacing predominately water and minerals and systematically through the support of the ingredients of the organs to rid themselves of excess acids and form reserves. Sodium citrate and potassium citrate serve as an acid regulator and are suitable to immediately adjust the pH values of the gastrointestinal tract. For mineralizing, with ROYAL SPORT the following materials are used: sodium, potassium, magnesium and calcium, which help balance out the deficiencies. Glucose, saccharose, maltodextrin, fibregum, vitamin B complex, vitamin C, carnithine, taurine, linden, chamomile, green tea. Dextrose, saccharose, maltodextrin, acacia fibre; adiculants (citric acid, natural green tea extract and glycine), acid regulators (potassium citrate, calcium carbonate, magnesium carbonate and sodium citrate); natural lime blossom extract, natural chamomile blossom extract, sodium dihydrogenphosphate, calcium ascorbate, L-carnitine, taurine, aroma, riboflavin (vitamin B2), pyridoxine hydrochloride (vitamin B6). 2 x daily, 2 teaspoons (10 g) to ca. ½ litre of water. Royal Sport is guaranteed to be doping free. Certified by an official doping board of control. It’s best to prepare ROYAL SPORT in the Royal Sport drinking bottle* with the special sports lid (contents 0.5 liter). 10 grams of powder is added to a half a liter of tap water and dissolved. Please do not use mineral water, that would improperly change the salt content.